A pregnant California woman walked into a West Covina Subway restaurant Monday morning and asked a worker for a cup. Video shows the woman walking over to the soda machine and then into the bathroom, where she reportedly gave birth to a newborn and then walked out, abandoning the child. 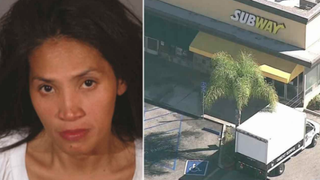 According to KTLA, restaurant workers called police, who followed a trail of blood to an alleyway not far from the Subway, where they found and arrested 37-year-old Mary Grace Trinidad on suspicion of attempted murder and child abandonment. The baby boy was found alive inside the toilet and on Tuesday was reported to be in good condition and will soon begin taking formula, a West Covina Police Department spokesman told the news station. Trinidad remained hospitalized and, as of Thursday, it was not known when she would be released, police said.